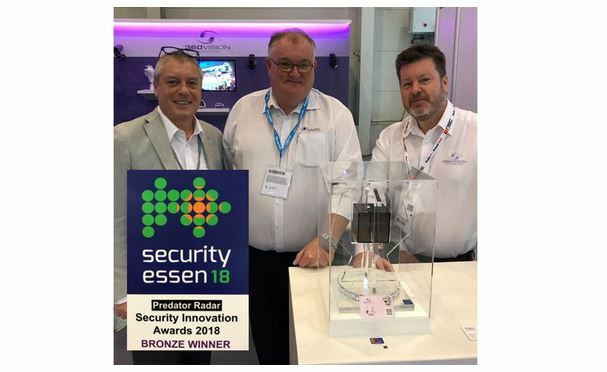 Security ESSEN 2018 - Security Innovation Award 2018 Bronze Winner, the 360 Vision Technology Predator Radar will be demonstrated today at ESSEN utilising the latest edition of TITAN VISION PSIM solution. Pictured with the trophy: Mark Rees (360 Vision), Jay Shields (TITAN VISION) and Pascal Wojciechowski (360 Vision). The Award Winning Camera will be in action on Booth 5E08 Hall 5.